MK Motti Yogev berates Arab MKs at Ben Gurion Airport for going to Europe to campaign against Nationality Law. MK Motti Yogev (Jewish Home), a member of the Knesset Immigration and Absorption Committee, met several Arab MKs at Ben Gurion Airport Monday. The MKs Yogev met included Ahmad Tibi, Taleb Abu Arar and Yosef Jabarin, who are leaveing for Brussels to campaign against the Nationaly Law in the European Union. Yogev said to them: "We welcome immigrants who come to Israel today and we welcome you to leave Israel and that is what you are looking for. To all olim, welcome. And to those who are leaving: this is not your country. MK Ahmad Tibi (the Joint List) who was with his children asked Yogev: "Is that what you are telling the children?" MK Taleb Abu Arar told Yogev: "I am a native of Israel. Yogev answered him: "I am a native of the land long before you: this is the Land of Israel, forever, it will be the land of Israel and all the traitors out." Yogev continued: "Ramallah will also be Israel. Go to Paris or to Britain. Go to your anti-Semitic friends, We welcome your leaving, your place in the hall of those who leave." Tibi responded:"Some advice from a doctor: Take your medicine three times a day." 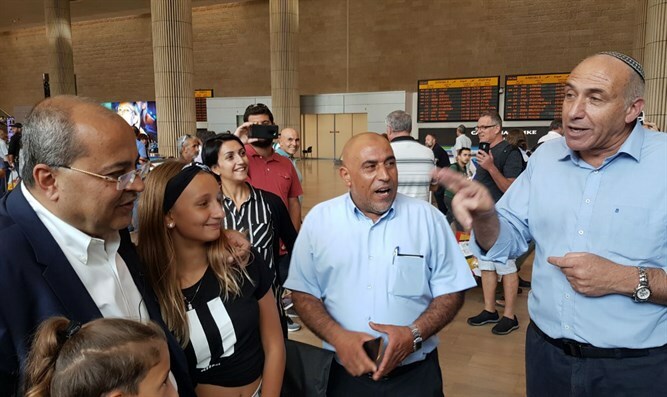 Yogev arrived at Ben-Gurion International Airport in order to welcome immigrant youth to Israel as part of the Na'aleh program of the Ministry of Education. The program is currently absorbing 2,000 new students who are coming to study in Israel."